After the gift-giving whirlwind of the holiday season, shoppers start to think about the next big thing: vacations. In fact, as we analyzed Criteo data across our travel clients, we found that there is a significant spike in travel bookings right after December. Our travel market research revealed that, in the US, there were up to 65% more daily bookings in the first quarter of 2017 when compared to the averages we saw in November 2016. We also wanted to dig into the broader implications of how people book their trips: What devices are most popular? How does that vary across regions? And what’s the impact of having a travel app? So we conducted Criteo’s Travel Flash Report to dig deeper into what happened last year. That way, we could help any marketer in the travel industry start getting ready for 2018. Travelers are a highly mobile audience. 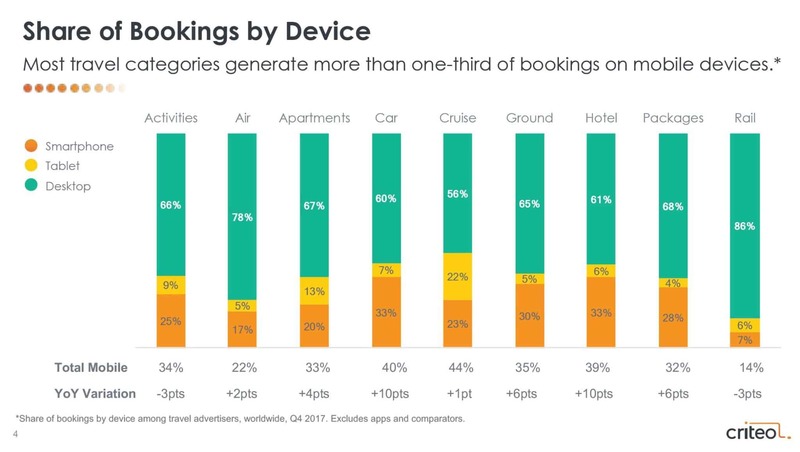 Most travel categories generate more than one-third of their bookings on mobile devices, with the highest bookings occurring in the “Car” and “Hotel” categories. When it comes to the highest desktop usage, “Rail” was the most popular, with 86% of bookings taking place on desktops. In our Global Commerce Review Q3 Report, we broke down all of the cross-device data for transactions around the world. One common trend seemed to be the decline in tablet usage. Similarly, travelers seem to be booking fewer trips on tablets. Instead, they are more likely to turn to their phones or their computers. Cross-device journeys indicate that travelers often start on one travel site and end up on another. The same thing happens with devices – travelers research on their phones and, later, finalize the booking on a desktop. More than a quarter (28%) of bookings via online travel agencies were preceded by a click on another device. Almost a third (32%) of bookings via suppliers were preceded by a click on another device. Have you ever panicked and realized that you were missing out on a good deal for a vacation? Or landed somewhere and realized you might want to extend the trip? Well, you’re far from alone. And when that moment strikes, most travelers book those items on a mobile device. Up to 80% of last-minute bookings are made on mobile devices. This indicates a potential opportunity for any business in the travel space – make those last-minute deals responsive and extremely mobile-friendly. The odds are that your audience is looking at them on their phones. Our research emphasized the overall importance of apps, too. Any travel advertiser with a booking app saw 33% of bookings come through mobile web and 27% of bookings come through their apps. The majority of mobile bookings is still on the rise, but apps are becoming a preferred method of purchase for many travelers. 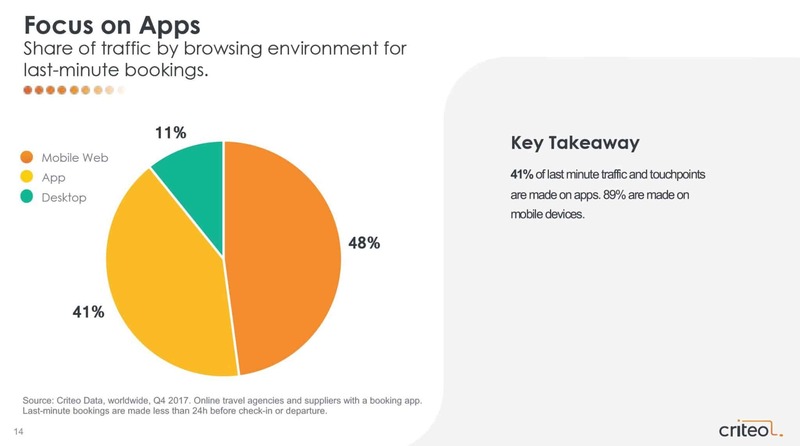 It also seems that travelers prefer to use apps to make their bookings. Building an app that offers a great experience won’t only promise more bookings, it could also result in more dollars per each transaction. Finally, our data revealed that apps convert a lot more than mobile web. For travel advertisers with an app, the conversion rate is 5x higher on the app than through a mobile browser. The winter is prime time for travelers to start researching and booking vacations. And what we really saw, more than anything else, was that predominantly mobile travelers can potentially have higher value for any travel business. This is especially true for those who book via an app: they convert at a higher rate and their trips tend to be slightly higher value. Our cross-device findings showed, too, that the journey for any traveler is often a complicated one. Data is the key to connecting the different pieces of this puzzle, but businesses may need to consider partnering in order to maximize the effectiveness of that data, as we discussed in our presentation with Forbes about the collaboration imperative.